On 24 March 2015, Mr. Mircea Ciopraga, Secretary General of the PS IGC TRACECA met with deputies of the European Parliament – Ms. Ramona Nicole Manescu, member of the Commission for External Policy and Mr. Marian-Jean Marinescu, member of the Commission for Transport in the European Parliament. 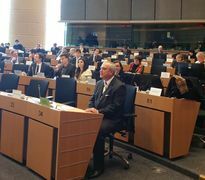 Participants of the meeting discussed the possibilities of supporting the TRACECA organization by the European Parliament, as well as the perspectives of cooperation, broadening of the dialogue and presence. During the meeting it was emphasized that the deputies of the European Parliament are open for the dialogue to achieve aims and objectives that TRACECA facing and ready to support the cooperation between TRACECA organization and the European Commission. Mr. Ciopraga, TRACECA Secretary General informed the participants of the meeting on his intention to make visits to all TRACECA countries with the view of discussing the issues regarding TRACECA future.